New around here? Get my monthly newsletter for even more green beauty goodness. Thanks for visiting! Carefully chosen to address fine lines, puffiness, inflammation and dark circles, the 21 active ingredients in Laurel Whole Plant Organics’ Eye Serum deliver something similar to sleep in a bottle to tired, parched, delicate eye skin. Packaged in a Miron glass dropper bottle, this eye serum (which is truly an eye oil if you’re wondering about texture) is almost scentless and feels like a second layer of fresh skin when applied around the eyes and orbital bone. All you need is one drop to cover both eyes, but if you’re feeling a little gluttonous, go ahead and try one drop per eye, and extend the oil to your temples and brows. Those areas could use a little extra love, don’t you think? In true Laurel, herbalist-meets-mixologist fashion, this moisturizing eye serum features a whole plant blend of ingredients high in vitamins, minerals and carotenes, which are important antioxidants and precursors to vitamin A. Ingredients such as bilberry, fennel, licorice, nettle, chamomile and rosehips offer what they can to reduce puffiness and darkness while softening the skin and imparting a bit of dewy goodness to your peepers. While I can’t detect any strong scent in Laurel’s Eye Serum, note that it features a delicious blend of organic and therapeutic grade essential oils, including rose, Roman chamomile and sandalwood. All of these scents keep the blend soft, and are actually there for more than just scent. Each ingredient is helpful with softening the skin and reducing the appearance of fine lines. When it comes to the carrier oils in Laurel’s Eye Serum, you can’t get much more decadent than a personal favorite, borage oil, as well as rosehip seed oil, red grapeseed oil and cranberry seed oil. Borage oil, which I also take internally to support skin health, helps reduce inflammation and is high in essential fatty acids (two reasons I also like it internally!). Rosehip seed oil, another old favorite, is high in vitamin C and marries beautifully with red grapeseed, which overflows with vitamins C, D and E.
And finally, a staple in many skincare blends, cranberry seed oil offers that touch of natural sun protection and adds another shot of antioxidants. 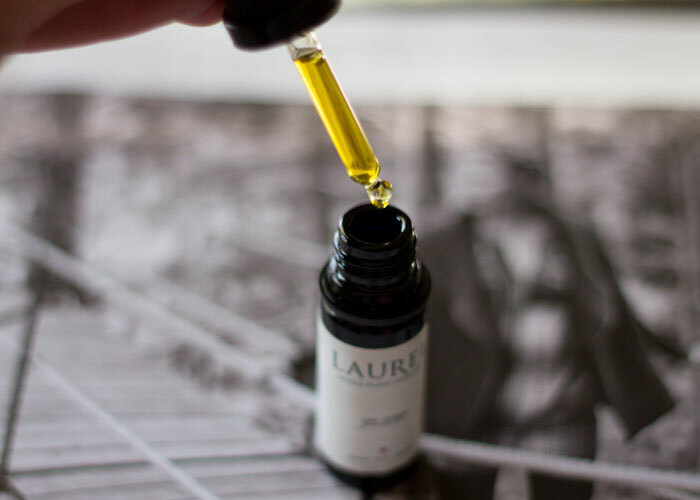 Laurel Whole Plant Organics’ Eye Serum is nothing short of luxurious layered atop your evening skincare products, but is also light enough to wear during the day. However, I do prefer to keep it to evening use because I’m heavy-handed and tend to play with two drops instead of one. I think this (and all oil-based eye serums) would be absolutely perfect if it was instead offered in a rollerball. That way, it would feel more portable (think applying on trains and airplanes) and would keep my need to apply way too much in check. Laurel, thoughts? Readers, know of places to buy rollerballs to fill? As you can probably guess, I’m a huge fan of Laurel’s line and love that she has product options for different times of year (try the eye balm in the dead of winter or if you are extremely dry and need some extra oomph). Besides the packaging request, this eye serum is a winner. I’d get it again if it was in a rollerball! Do you use eye oils? How do you prefer them to be packaged? When do you use creams, serums and oils around the eyes? What have you tried from Laurel Whole Plant Organics? Tell me in the comments section! kimberlyloc.com may include affiliate links to featured products. Not all product links are affiliate links. If you make a purchase from an affiliate link, kimberlyloc.com earns a small commission. Your privacy is important to me. Please visit kimberlyloc.com/privacy-policy to learn more about how your data is protected. like this post? get the newsletter!